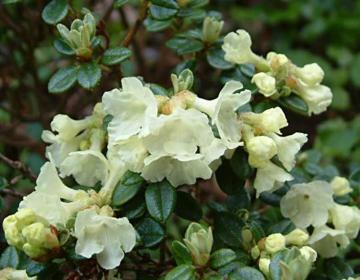 Compact, dwarf evergreen with twiggy, scaly shots and dense foliage of small, elliptic, aromatic green leaves, scaly golden-brown underneath. Flattened trusses of small, tubular, pale lemon-yellow or creamy-white flowers in spring and early summer. Likes a cool, moist position and well drained, humus-rich, acid soil. Can be fussy and tricky to grow. Suitable for a cool spot in the rock garden. Introduced from Sichuan by Ernest Wilson about 1904.